Each second of the day, someone in America faces a crisis, whether it’s a car accident, violent crime, serious illness, or financial trouble. Given the inevitability of adversity, we all wonder: Who beats the odds and who surrenders? Why do some people bound back and others give up? How can I become the kind of person who survives and thrives? The fascinating, hopeful answers to these questions are found in THE SURVIVORS CLUB. 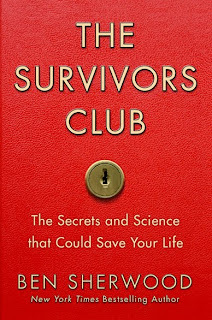 In the tradition of Freakonomics and The Tipping Point, this book reveals the hidden side of survival by combining astonishing true stories, gripping scientific research, and the author’s adventures inside the U.S. military’s elite survival schools and the government’s airplane crash evacuation course. There is no escaping life’s inevitable struggles. But THE SURVIVORS CLUB can give you an edge when adversity strikes. Thanks to Anna at Hachette Books, I have 5 copies of The Survivors Club to giveaway to 5 of my readers.